Always read and follow the safe use, storage and disposal instructions on the product label. Store harmful household products and pesticides out of reach of children and pets. Store in a locked COSHH cabinet in a utility area or garden store with lots of ventilation. Store flammable products outside the living space in locked flammable cabinets and far away from places where they could catch fire. Keep flammable products away from portable heaters, electric heaters, central heating boilers and outdoor grills. Never store pesticides or other household products in cabinets where food is stored, or near food intended for people or animals. Never store pesticides where you keep medicines. Ideally pesticides should be stored in lockable pesticide cabinets. Always store chemical based products in their original containers so that you can read the label for directions on their use, storage and disposal. Never transfer flammable liquids, pesticides or other household products to soft drink bottles, milk jugs or other food containers. Children, or even adults, may mistake them for something to eat or drink. Never mix different cleaning fluids or pesticides. Chemical reactions can occur creating dangerous gases and in some cases exothermic reactions with the potential to cause fires and explosions. Always dispose of unwanted chemicals particularly petroleum based products and pesticides responsibly to protect your environment. Do not tip down drains, into drainage dykes, rivers or onto the land. Look out for new products that are less hazardous and environmentally friendly such as Propylene Glycol antifreeze or use safer alternatives. 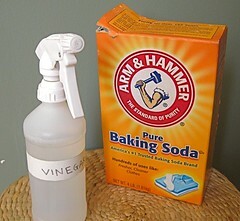 A combination of vinegar and baking soda is good at clearing blocked waste pipes. Have emergency numbers for fire services, environmental office and your doctor in a convenient place in case of emergency. Seconds save lives. This entry was posted in Hazardous Storage and tagged containers, controlled drugs, flammable storage, hazardous chemical storage, hazardous chemicals, hazardous storage, hazardous substances, storage by barrie.holden. Bookmark the permalink.